The flag of the United States (often known as "Old Glory" or "the Stars and Stripes") contains 13 alternating red and white horizontal stripes (the top stripe is red), with a blue rectangle in the canton (known as the "union") containing 50 small white five-pointed stars. The flag may also be decorated with a gold fringe, which although not part of the flag itself, is quite common, for example in Army parades. The 13 stripes of the flag honor the original 13 colonies, and the 50 stars represent the 50 states of the Union. Over time more stars have been added as more states have joined the Union, the current design having been adopted on July 4th 1960 after the accession of Hawaii as the 50th state. Many American citizens understand the flag to stand for US Constitution, the Bill of Rights, the Declaration of Independence and the freedoms and liberties of the country in general, as well as past sacrifices in wars to protect those freedoms. The symbolism of the flag is understood by different people in different ways, for example, many people take the red to stand for the blood of past sacrificies, and white to stand for the purity of the freedom ideal. U.S. Federal law contains many regulations about the use, display and disposal of the flag, however there is no penalty for failure to comply with these regulations because this would conflict with the 1st Amendment to the United States Constitution. By custom, the US flag is flown continuously at certain locations including the White House in Washington D.C., and the Marine Corps War Memorial in Rosslyn near Arlington National Cemetery in Arlington, Virginia. Additionally, US flags are also on continuous display on the moon, having been placed there by the Apollo 11, 12, 14, 15 and 17 space missions (it is unclear if the Apollo 11 flag was knocked down during the take-off of the Lunar Excursion Module). Quality! Expertly sewn using Annin's HEAVYWEIGHT 200 DENIER NYLON fabric dyed in our VA factory with our exclusive SolarGuard dyes. PROVEN to last the longest and be the BRIGHTEST. This DURABLE fabric flies in a light breeze and blocks damaging UV rays. U.S. historical flags, the American flag that draped Abraham Lincoln’s coffin, America’s Cup yacht flags, the first U.S. flag raised at Iwo Jima, flags for the United Nations, American flags for the U.S. Olympic Committee, the U.S. flag at the 9/11 Memorial and the Apollo 11 mission to the moon. Annin has made them all. In the most patriotic of times, Americans look to Annin Flagmakers to supply them with the Stars & Stripes. Made In USA: 100% American Made. Don't fall Victim to "Cheap China Knock Offs". This Flag is an Original Grace Alley American Made Flag. When you display this US Flag, You will feel the Pride with this American Flag. Fly Your US Flag Proudly. Warranty: Your Flag comes with a "1 Year No Questions Asked Warranty". Nothing but the Best for Your American Pride. This US Outdoor Flag is also a great replacement flag for Any USA Flags 3 x 5 Ft.
Made In US: 100% American Made. Don't fall Victim to "Cheap China Knock Offs". This Flag is an Original Grace Alley American Made Flag. When you display this US Flag, You will feel the Pride with this American Flag. Fly Your US Flag Proudly. Warranty: "1 Year No Questions Asked Warranty". Nothing but the Best for Your American Pride. US Flag Ships From Amazon and With the "Amazon Guarantee of Satisfaction." 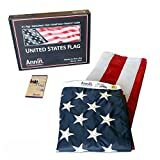 Allied Flag American home us flag Set comes with everything you need to easily fly an American flag from your house or porch. Featuring a 3' X 5' Embroidered nylon us flag, This set is the perfect way to show your patriotism without a space consuming in-ground pole. The bracket is adjustable to 13 different positions, so you can fly your flag at whatever angle you choose. The 5' Spinning flag Pole prevents the included us flag from tangling - a much needed feature for windy States. Nylon us flags fly in the lightest breeze. The embroidered stars & stitched stripes will not fade like a printed flag, will last much longer & are much more beautiful. PROUDLY DISPLAY YOUR AMERICAN FLAG This flag is great for celebrating holidays like Independence Day, President's Day, and Labor Day, everyday display, and as a gift to a loved one. Whether you're looking to show your pride for the USA everyday or celebrating a special occasion, this flag is perfect for your needs. 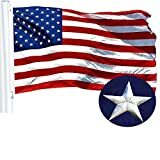 TWO BRASS GROMMETS Securely fastened to the strong durable polyester canvas heading, this flag features two solid strong brass grommets for hanging. This flag looks good on in ground flagpoles as well as mounted flag poles. Grommets are heavy duty and anti rust, perfect for flying in various weather conditions. Size:3 x 5 Ft American Flag. Embroidered Stars and Sewn Stripes with Double-Needle Lockstitch with 4 Rows on the Fly Hem. Heavy Duty Polyester Canvas Heading with Two Solid Brass Grommets. Dimensions: 3 Feet x 5 Feet. This Durable Flag can be displayed either indoors or outdoors. United States of America Deluxe Flag. Size 2.5'x4' -- Proudly Made in USA. -- Also available in 2'x3', 3'x5' and 4'x6' Sizes (see separate listings). Jetlifee American Flag 3x5 Ft - by U.S. Veterans Owned Biz. 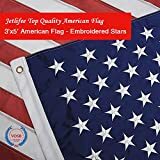 Heavyweight Nylon Embroidered Stars, Sewn Stripes, Brass Grommets US Flag.Outdoors Indoors USA Flags Polyester 3 x 5 Foot. ⭐FLY THE AMERICAN FLAG - Display your patriotic feelings in all weather conditions with Jetlifee premium USA flag proudly flying in your home, commercial store or garden! A premium quality American flag made of sturdy NYLON will withstand heavy rain, strong winds or the scorching summer sun, making a unique durability, long-lasting American flag for lifelong use! 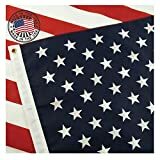 ⭐PERFECT FOR COUNTLESS PURPOSES - Peerless quality and extremely durable, this high-end American flag will make an excellent replacement for all standard American flags and Our flags are partially imported. Ideal for both INDOOR and OUTDOOR use, it will fly proudly to underline your patriotism in political events, sports organizations, football matches, or the world cup! ⭐MONEY BACK GUARANTEE At Jetlifee, in case you are not positively thrilled with our USA flag, Your Flag comes with a 1 Year No Questions Asked Warranty. FLY THE AMERICAN FLAG - Display your patriotic feelings in all weather conditions with Jetlifee premium USA flag proudly flying in your home, commercial store or garden! A premium quality American flag made of sturdy NYLON will withstand heavy rain, strong winds or the scorching summer sun, making a unique durability, long-lasting American flag for lifelong use!MATERIAL - Unlike cotton home garden American flags, our USA flag is made of HEAVYWEIGHT NYLON specially treated to dry fast. It will withstand the wear and tear of harsh weather conditions outdoors, keeping its colors vibrant FOR LIFE! With EMBROIDERED STARS and SEWN STRIPES and featuring STURDY BRASS GROMMETS, it makes a top craftsmanship flag that will complement your garden, yard or living room dcor!PERFECT FOR COUNTLESS PURPOSES - Peerless quality and extremely durable, this high-end American flag will make an excellent replacement for all standard American flags. Ideal for both INDOOR and OUTDOOR use, it will fly proudly to underline your patriotism in political events, sports organizations, football matches, or the world cup!PERFECT GIFTING IDEA - Easy to fly, reliable and COMPETITIVELY PRICED, our American flag will make the perfect gift to all Americans, highlighting their pride in the USA honorable history! Ideal for household or commercial use, it makes a large American flag that will have the lucky recipient thankful for your excellent taste!MONEY BACK GUARANTEE At Jetlifee, in case you are not positively thrilled with our USA flag, Your Flag comes with a 1 Year No Questions Asked Warranty. 100% 30 DAY MONEY BACK GUARANTEE: We feel confident knowing you will love our flag, however if you are not satisfied for any reason, simply return your product for a full refund, no questions asked. This product is imported to USA and contains 100% Nylon fiber. US American Deluxe Heavyweight Nylon Flag. Made From Heavyweight Nylon 210 D Oxford grade. Available sizes: 6x10 ft, 8x12 ft, 5x8 ft, 4x6 ft. Embroidered Stars. Dimensions: 6 Feet x 10 Feet. This Durable study Flag can be displayed either indoors or outdoors. 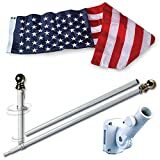 Contains Two Hosting Grommets so US Nylon flag can be connected to a pole. United States of America Deluxe Flag. This product is imported to USA and contains 100% Nylon fiber. 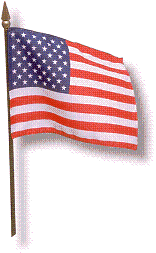 Size:4 x 6 Ft US American Deluxe Quality Polyester Flag. Made From Quality Polyester. Embroidered Stars and Sewn Stripes with Double-Needle Lockstitch with 4 Rows on the Fly Hem. Heavy Duty Polyester Canvas Heading with Two Solid Brass Grommets. Dimensions: 4 Feet x 6 Feet. This Durable Flag can be displayed either indoors or outdoors. United States of America Deluxe Flag. Size 3'x5' -- Proudly Made in USA. -- Also Available in 2'x3', 2.5'x4' and 4'x6' Sizes (see separate listings).